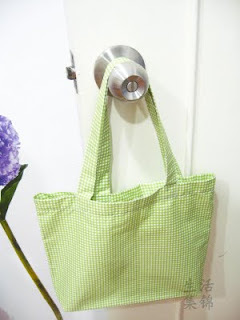 Due to my last post about packing lunch to school, I've made a simple tote bag which I named Lunch tote. It also has something to do with my recent craze which is sewing. I detest sewing, had never dream of using a sewing machine or even make anything with it before but upon browsing the many blogs by creative home makers and designers, also inspired by my friend Nok, I have fallen in love with patterns and fabrics altogether! In fact the craze gets worse and worse each day that I am very much still head over heals! Noticing my sleepless nights last week, my beloved husband (I'll take a break from calling him Hobbit for once) finally encouraged me to go all the way and pursue my new found love. He kindly chipped in some moola to my ever tiny savings (yang tidak pernah menjadi bukit) and like magic there on my study room...sat a small cute sewing machine! With zero knowledge of sewing, beloved husband figured how to ensemble the machine, place the threads and spin the bobbins while I nervously figured the measurements on my 1 meter fabric in an attempt to make a tote bag! NEVER sew but wanna make a TOTE BAG!!! 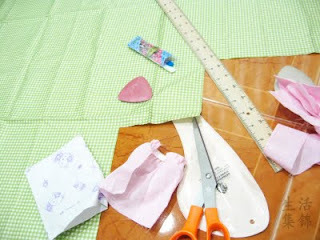 I even cut the fabric across with my hands shivering as if I was having malaria! It took me about 3 hours to finish on the bag. The hems and stitches were no were but a very novice job, winding stitches here and there not to mention how many times the thread got stuck on the machine... Nevertheless, I could say I was VERY satisfied despite the notion that I always had that I could never sew. pattern was inspired by one of the member at Burda. Went to bed at 2am the first night I got my mainan. Yet slept with a smile as big as half the full moon! My mom must be very proud that her daughter finally WANT to sew! 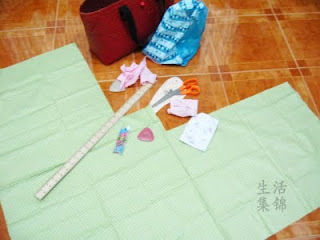 I'm glad that you are now crazy about sewing too!Keep it up and soon we will have our own shop.